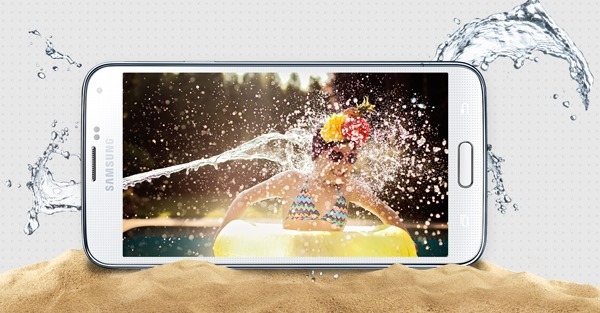 When Samsung announced its Galaxy S5 hero phone we were more than a little skeptical. Not because we doubt that it will sell like crazy worldwide, nor because we think that Samsung’s continued reliance on plastic will see existing Galaxy S fans switch allegiances elsewhere. What we really weren’t too sure about was the claim that the Galaxy S5 will feature an IP67 rating for both dust and water resistance. According to the IP67 standard, that means that the handset should be able to withstand being a meter below the surface for up to 30 minutes without any ill-effects. Given the use of that aforementioned flimsy plastic, more portholes than an ocean-liner and removable rear panel for easy battery replacement, we found ourselves more than a little reluctant to test such a thing out for ourselves. Thankfully, one YouTube channel owner decided that the only real way to test Samsung’s claims was to dunk a new Galaxy S5 in what appears to have been the tallest, dirtiest and probably most green fish tank he could find. The result? Well, was there ever any doubt? The full video stretches on for longer than we care to sit and watch something be submerged, but the end result is undeniable. The Galaxy S5 copes will with the water – and grime – that it’s faced with and even manages to receive a call while it’s in there. We can’t deny being a tad impressed by the whole thing, which leaves us wondering if an IP67 rating is going to become the new standard for smartphones. Will the iPhone also come with such a rating? Given the amount of times we’ve heard of people dropping phones into various water receptacles, we can only hope so. As an impressive a feat as it is, we’re still not sure we’d be recommending taking a Galaxy S5 into the pool the next time you go swimming, but if you were to get caught in the rain or dip it into a bath, we’re pretty sure you’ll be just fine.